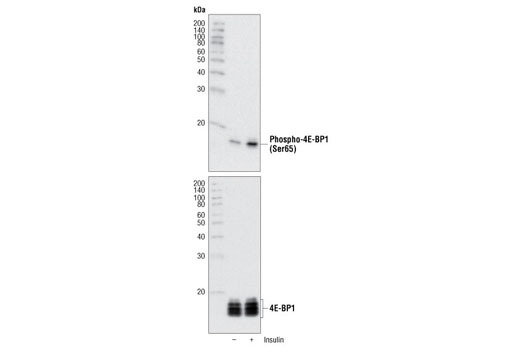 Phospho-4E-BP1 (Ser65) Antibody detects endogenous levels of 4E-BP1 when phosphorylated at serine 65. This antibody has been shown to also recognize 4E-BP1 when phosphorylated at serine 101 (See application reference, Wang et al. 2003). Polyclonal antibodies are produced by immunizing animals with a synthetic phosphopeptide corresponding to the sequence of mouse 4E-BP1. Antibodies are purified by protein A and peptide affinity chromatography.